I realized after I got there that there are still 12 more little flower blocks to embroider! 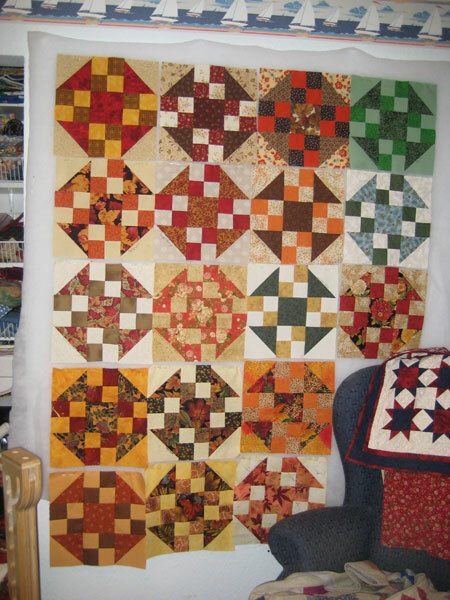 Thank goodness they were placed in the quilt in groups of four, so I was able to put plain strips in as place holders until I can get them done. Mine is only 12" x 14" and some of the pieces in the presents at the bottom are only 1/4" across! 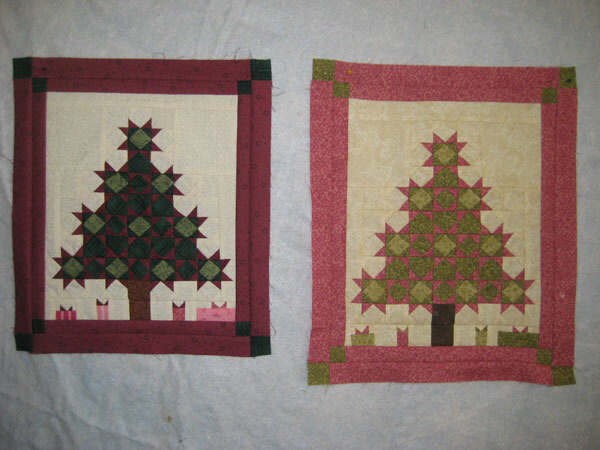 We had the idea that these little pieces would make great Christmas presents, but decided that these will be our only little trees – they were probably more labor intensive than a big quilt would be!! At the end of the retreat, we had the drawing for the grand door prize. Each of us was required to make a signature block out of the same pattern in fall colors. On Saturday the winner of all of the blocks was chosen – and that would be moi! Not only do I get to keep all of these, I get to design the block for the next retreat. What fun! Several news updates from last week. Thank all of you for your well wishes for Ben and his family. I'm happy to report that after only two weeks of unemployment, he has a job! I'll report on more as I know more, but it is a tele-commuting job, so he will be working at home. It sounds like a very good job and we're so excited for him and Abby. Also, as I may have mentioned, we had hoped that down the road Maggie would be having puppies. The breeder came out to look at her this week, and although she said she is absolutely beautiful with many features that she would like to pass along, she is not going to breed her. Because of the structure of her hindquarters, she is afraid that a large littler would do some serious harm. She could probably carry a small litter successfully, but Kathy will not take the chance on harming Maggie. I respect her so much for that! In the end it doesn't make any difference to us because she gave Maggie to us and all of the puppies would have belonged to her. But she said that her greatest concern is the welfare of her dogs. So Maggie will go in this week for "the operation" and then return home to us for the life of a pampered pet! Dorothy, your quilts are beautiful! 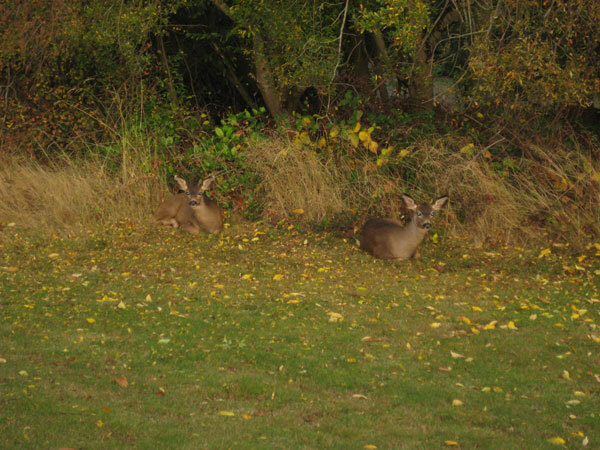 I wish I could get pictures of ‘our’ yard deer. They sleep in our back yard in the winter night. If I took a pic with flash, they’d bolt. I have touched the upstairs blind and they jump up to leave. They are always gone by daylight. Nice retreat. I love the Garden Path quilt. Wow, where to start. I was going to tease you and say that Warm Beach isn’t on the mainland, but on Camano Island, but that’s not true, huh? It’s closer to Stanwood right? It’s been years since I’ve been there, but have had lots of family work there and in their nursing home. 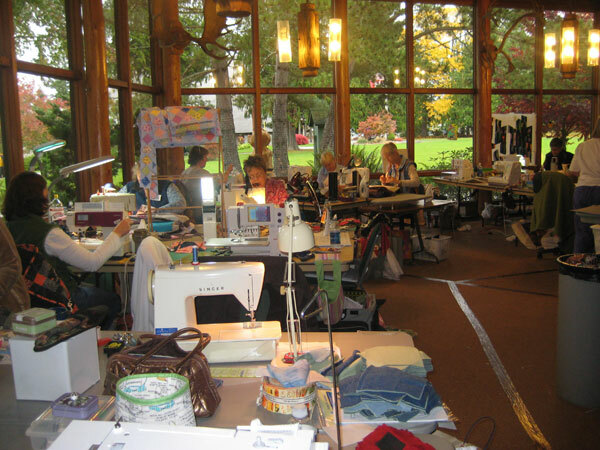 What a great place to have a retreat, where you could sew and see out those windows all day and not feel stuffed into a building. Your Garden Path looks gorgeous of course and not only is it exciting that you won the blocks, BUT you get to design next year’s! Neat! Your quilt is breathtaking! That is my favorite kind of quilt! Congrats on your win too! Glad to hear about Ben, that’s great news! Goodness you’ve been a busy lady. 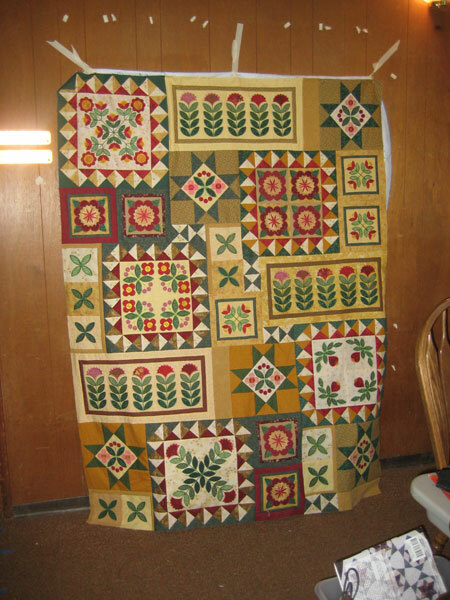 The quilts are just beautiful. I’ve been knitting socks and a project that didn’t work out (details later on blog), so there hasn’t been any progress on Chenille in Michigan. Congratulations to Ben on his new job. 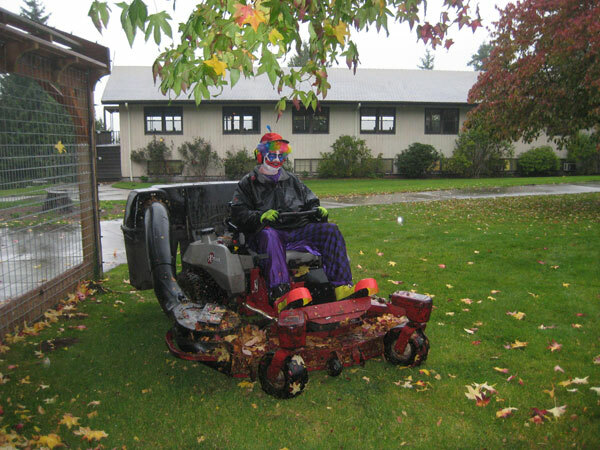 He must be a very talented professional to find a job in this economy. Does working at home mean he can move his home anywhere he’d like? Like Washington? What a wonderful retreat! Love your projects…. and congrats on winning the door prize! I have a 3 day knitting retreat coming soon. I can hardly wait…. (well, I guess it’s in February actually). Great news about Ben’s new job! I wish him/his well in the transitioning phase. And for Maggie – I would be relieved if I were you. At least with Chihuahuas, so many complications are possible….I would be a nervous ninnie if Sofee ever became “with child”. She also is in the pampered pet category. Those are beautiful quilts. Looking at them almost makes me want to rethink my “no new hobbies” rule. I have enjoyed working from home, although I’m not technically a telecommuter (since I’m not employed by any single company). It is really great not having to get on mass transit or crowded roads, but it does require a little discipline to keep work from spilling into your life all the time. I hope Ben finds it as fulfilling as I have–and I’m going on my 24th year of working from home. One thing that really works for me is getting out every day for a couple of hours, usually at the gym to swim or work out.